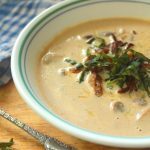 Keto Cream Of Mushroom Soup - Headbanger's Kitchen - Keto All The Way! Some of the best recipes are born out of spontaneity. I was not sure what to make for today’s episode till I looked in the fridge and realized I had 3 different kind of mushrooms. What more could I want? A cream of mushroom soup to end all cream of mushroom soups. 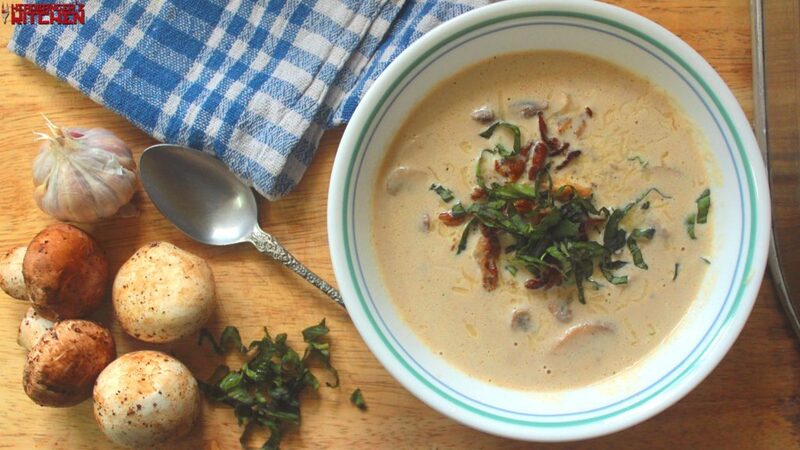 So here is the creamiest cream of mushroom soup that you’ll ever eat. Enjoy! In my books a soup is pretty much a complete meal and something I love having. It’s a great way to get in those veggies as well. Mushroom soup is one of my favourites and as you saw in the video I waste no part of the shroom. I use to the stalks and cook them and blend them to add a thickness to the soup, to give it body. Then of course the fried mushrooms for texture. I personally look to have enough elements in the soup to get the maximum flavour but also create textures. It should feel like a meal itself, not something to just warm you up for dinner (which it can also do). I have a couple of soup recipes on the channel which I’m sure you will enjoy. So try my Keto spinach soup or even my broccoli cheese soup. If you looking for something ‘meatier’ (pun intended), I have a great cream of chicken soup and an Asian style seafood soup as well. This recipe makes 3 serving. Get this recipe on myfitnesspal. Separate the mushrooms tops and the stalks and slice the mushrooms and set aside. In a large saucepan heat some olive oil and butter and fry the garlic. Once they release their water add in the blended mixture through a fine sieve. Garnish with cheese, the fried oyster mushrooms and fresh basil. NOT a soup cube. Filled with inflammatory poison. It doesn’t take long to make and freeze your own condensed broth. Can we use any flavor stock cube or do you use a specific flavor? Thank you!! Delicious and I inhaled it all! So easy and absolutely lovely! Best mushroom soup ever! I did add garlic and onion powder with chicken stock and omitted the chicken cube. I also added one good slice of Romano aged cheese just before serving. Extra Jum!! I loved your broccoli soup can’t wait to try this one. I love your recipes, thanks. This was so yummy. It made family smile. LOL, listening to you say ‘headbangers kitchen’ all cool and then a second later saying, “Ooooh yummy.” Was about the funniest thing ever. The soup looks amazing. I am so making this! Well done, sir and cheers. Just made this moments ago. Used some chicken bone broth from leftover smoked chicken carcass instead of water. The idea of frying the oyster mushrooms was brilliant. I used a mix of ghee and butter. All in all, this is the most heavenly creamy of creamy mushroom soup ever. Mind blown! We made this tonight and it was both easy and soooooo delicious!!! We will totally be making this again! Thank you for your talent and keeping it simple! I got so bored eating the same old keto recipes.. so tired this one… n OH MY GAWWWD! What flavour and what texture!!! I absolutely loved indulging myself. U rock! Just made this, so delicious! Since I’m the only one in the house that loves mushrooms I get it all to myself yay!